Spanish artist Pablo Picasso is perhaps the best known Modern artist of the twentieth century. Recognized for the seminal role he played in the development of the artistic style known as Cubism, Picasso’s art was first introduced to American audiences at the 1913 Armory Show in New York. Picasso’s painting Musical Instruments and Fruit Bowl on a Pedestal, from 1913, epitomizes all of the characteristics for which the Cubist style is best known. 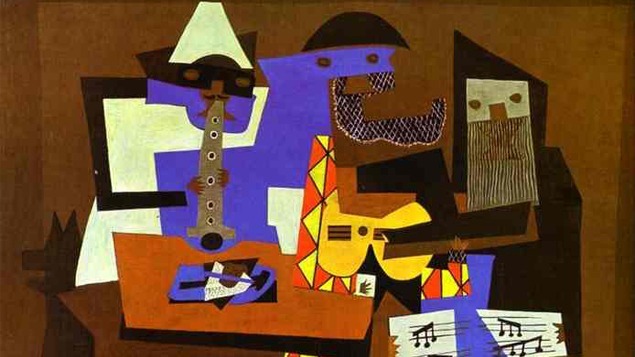 The style known as Cubism was pioneered by Picasso and George Braque in France in the early 1900s. Unlike artists before them, who believed that art should realistically depict nature, Picasso and Braque championed the idea that objects should be reduced to their essential geometric shapes and forms, broken apart, abstracted, and re-assembled to convey a range of viewpoints and contexts. In Picasso’s Musical Instruments and Fruit Bowl on a Pedestal, fragments of a traditional still life composition are identifiable: a violin, sheet music, and decorative furniture components are enveloped among other flattened, colorful geometric shapes. This experimental and innovative approach to making art revolutionized the artistic scene in Europe and eventually influenced artists working in the United States.